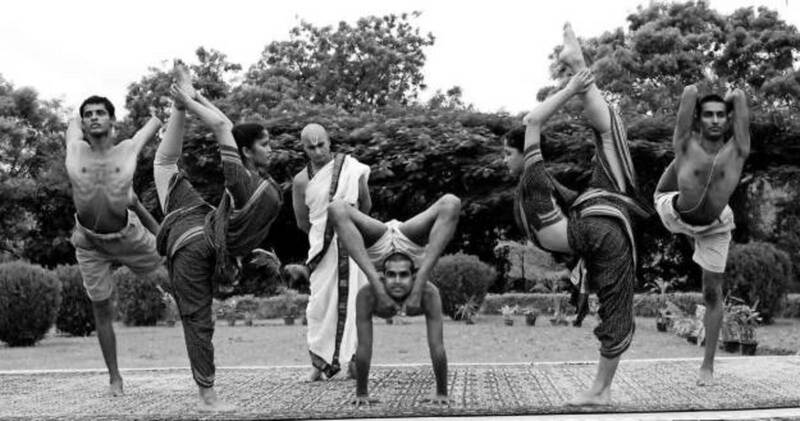 Ashtanga Yoga, or Eight Limbed Yoga is the product of one man, Sri K. Pattabhi Jois, studying at the Sanskrit College of India under the tutelage of the “Father of Modern Hatha Yoga”, Krishnamacharia in the 1920s and on. Pattabhi Jois began his studies with Krisnamacharia in the 1927 at the age of 12. Although it is often stated that “Yoga is thousands of years old,” Yoga as we recognize it today was birthed during this period of the early 20s at the Sanskrit college. Yoga has certainly been mentioned for thousands of years, but with only one or two postures being mentioned in the Yoga Sutras (our oldest aggregated text on Yoga, written in 400CE by Patanjali), that of Padmasana, or Lotus posture. The Yoga mentioned in the Yoga Sutras has to to with all Eight Limbs of Yoga, not merely the physical practice, that of Asana. Asana is now widely regarded as a doorway, the most accessible limb of yoga; Asana becomes a staff for one to wrap the mind around, something upon which to anchor, and still the mind, so that the real yoga, the yoga opened by the door of Asana can begin. Over time, more and more postures were found, incorportated and developed. They were experimented with in various orders by Pattabhi Jois in order to make the body strong enough and supple enough to spend hours in that master posture, Padmasana, the posture of contemplation. Krishnamacharia and his few, dedicated students, combed through the literature of the ages, looking for mention of asana and its purpose. Through these studies, each student, over time, developed a system which made sense to them. During this time, the British Raj had introduced "calisthenics" to Indian culture, influencing Krishnamacharia and his students to find a regimented and systematized practiced leading to strengthening of the body and discipline of the mind. Thus was born, in the late 1930s, what we now know as Hatha yoga, in all it’s forms. For instance, BKS Iyengar developed a method based on alignment and the idea of bringing the floor to the body, rather than the body to the floor. Sri K. Pattabhi Jois developed Ashtanga Yoga, a set sequence of yogic postures broken into series, the first of which is called Primary. There are six series in Ashtanga, and most people will not get through the first series in their lifetime. Lineage: Pattabhi Jois had several children, one of whom was Saraswathi Jois, who began practicing at age 10, and taught with her father until his death in 2004. Saraswathi’s son, Sharath, is now the holder of the lineage in Mysore, India, teaching in the main shala beneath the family home. Saraswathi opened her own shala down the road, and teaches about 150 people a day, six days a week, in the tradition of her father, and is a direct holder of the lineage as well.